"President Obama suffers from the most polarized situation in Washington that we've ever seen even maybe the time of Abraham Lincoln and the initiation of the war between the states...The number one factor [of misinformation about Obama] is Fox News, just totally distorting everything possible concerning the facts. I think their constant hammering away at these false premises about our incumbent president has a major impact on the consciousness of America. A lot of well-meaning people, including many of those in the Tea Party movement, believe what is said in this constant hammering away by Glenn Beck...."
On their site, the Glenn Beck section is 30 posts on each of 120 pages of research analyzing his false and sometimes absurd claims. There is also a sprinkling of posts among them listing the companies that still advertise on his Fox show. The mission of the Media Research Center, "America's Media Watchdog," is to bring balance to the news media. Leaders of America's conservative movement have long believed that within the national news media a strident liberal bias existed that influenced the public's understanding of critical issues. On October 1, 1987, a group of young determined conservatives set out to not only prove — through sound scientific research — that liberal bias in the media does exist and undermines traditional American values, but also to neutralize its impact on the American political scene. What they launched that fall is the now acclaimed — Media Research Center (MRC). The MRC, headquartered in Alexandria, VA, began modestly with a handful of employees, a black and white TV, and a rented computer. The first order of business was to organize a research operation second to none. For years, conservatives could only present the anecdotal evidence of liberal journalists' bias — a question in this interview, a statement in that report. However, anecdotal examples of bias do not prove a liberal agenda. Only through thorough, comprehensive, and ongoing analysis based on quantitative and qualitative research can one document liberal bias in the media. The result of the MRC’s work is a mountain of evidence to use in combating the undeniable bias. The key to the MRC’s effectiveness is the ability to prove bias by using scientific studies and word-for-word quotes from the media. Through the MRC's successful implementation of the largest, most comprehensive media monitoring operation in the world, the MRC serves as the checks and balances on the Fourth Estate. Through its divisions, programs, and a marketing effort that never rests, the Media Research Center has become an institutionalized machine on the issue of balance in the press. Why are the watchdogs of conservative media liberals and progressives and the watchdogs of liberal media conservative? Because this is how human perception works most effectively. 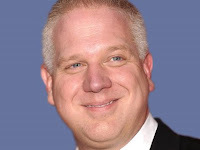 MRC's section on Glenn Beck scrutinizes the bias of Beck's detractors without giving notice ever to Beck's many deceptions, reactionary bias or hyperbolic propaganda. Right wing bias gets ignored at the MRC as if it doesn't exist. Similarly, Media Matters for America all but ignores "mainstream media" with a few exceptions. There is one page of posts on Anderson Cooper. They have also criticized the NY Times and the Washington Post, usually for inaccurate coverage of conservative media figures. Progressives are better suited to cast a critical eye toward conservatives and conservatives are better suited to cast a critical eye toward liberals. Why? Researchers at MRC don't turn a blind eye toward Beck's reactionary bias; they share it and cannot detect it. They cannot experience Beck's deceit although it's difficult from a liberal POV to understand how they can miss it. MRC and Media Matters for America both engage in selective exposure, and when they do examine the same event, a speech by President Obama perhaps, they will come away with different understandings about what he said. This isn't devious or intentional misinterpretation; it's part of the human condition. This is why it takes a liberal or progressive to critically analyze a media figure like Glenn Beck just as it takes conservatives to critically analyze a media figure like Keith Olbermann. The distinction that needs to be drawn is between bias and truth. The most objective observer in the business has some bias. What subject is addressed, what questions are asked, what questions are not asked are are editorial decisions based upon what an individual values as important. Bias is inherent in all media. 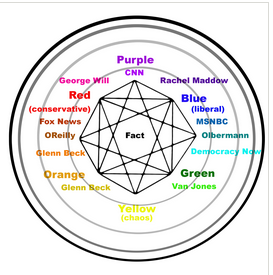 That is implicit in the truth mandala below. Distorting the truth, on the other hand, is not inherent in any media. The circles around this mandala's edge represent various degrees of false claims. It is human to get the facts wrong on occasion; it is entirely something else altogether to not make corrections. Correcting mistakes is what gives journalists and media outlets credibility. Not correcting false claims and mistakes stems from "truthiness." This word was coined by comedian Stephen Colbert to describe the quality of something feeling true without any evidence suggesting that is actually pertains to the facts. Thus America is bifurcated into two halves whose beliefs could not be reconciled: people who "think with their head" and people who "know in their heart. "(3) Like Colbert, Glenn Beck knows in his heart what is "true" about progressives, Obama, the Administration, health care reform, etc. He has often said, "This doesn't feel right." It is the work of Media Matters for America, the Glenn Beck Report, News Hounds this Review and other efforts, including President Carter's observation, to put our leftward biases to the service of critical analysis and fact-checking to make others aware that what Glenn Beck "knows" in his heart does not often comport with what the rational mind determines to be the facts. This split between bias and truthiness is the struggle for accurate information in America, what reactionary radio host, Alex Jones, calls the Infowars. In this war, in this struggle for honest facts, the first victim is the truth. If truthiness prevails in this struggle, the last victim will be our democratic order.